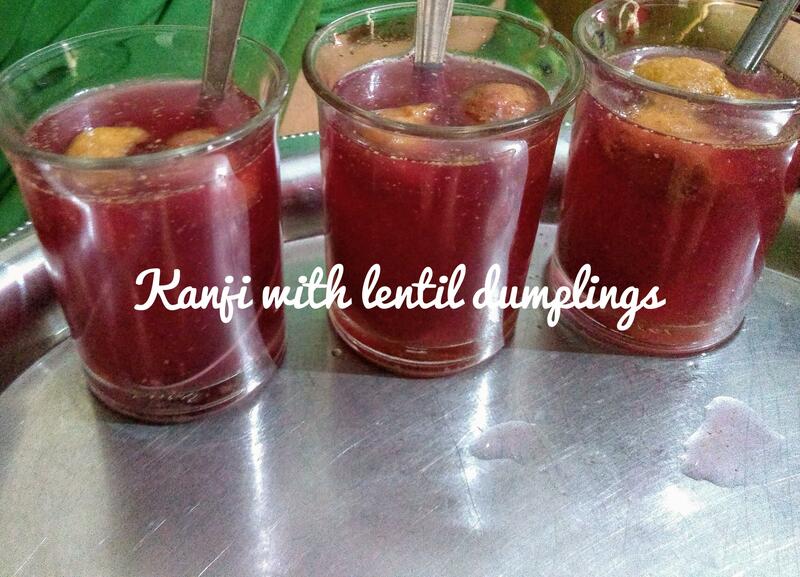 Mamta's Kitchen » Kanji Carrot & Beetroot Drink - Chilli Hot! Kanji Carrot & Beetroot Drink - Chilli Hot! This hot and fiery drink is very popular in Northern India in winter months, the carrot season. Here in UK, it is more suitable for our summers. It is rather an acquired taste, you either love it or hate it. It's fermented aroma is also something you have to learn to enjoy. I have only ever met one English couple, who were brave enough to try it and then they fell in love with it! It is made especially for the Holi festival, the festival of colour celebrated in March/April in India. On Holi, it is usually served with Vadas, which are soaked in this water, rather than the usual yoghurt sauce. In old days, kanji was made in earthenware pots, but these have now been replaced with glass jars. Served as an appetizer, it gets the gastric juices flowing! 2 tbsp. coarsely ground mustard seeds, freshly ground. Old ground seeds can make the drink bitter. Place all ingredients in the jar, stir well, close lid and leave on a warm, sunny window sill for 3-4 days. It will slowly ferment, get darker in colour and develop a slightly sharp, tangy taste. the crushed/coarsely ground mustard will rise to the top and float on the surface. Strain to remove all carrots and beet roots. Discard solids. Some people like to munch these carrots and beetroot, but I discard them. It is a personal choice. Chill in the fridge and serve in small glasses before a meal. At Holi festival, urad dal dumplings or Vada can be added to this drink one day before serving. This is called 'Kanji Vada'.